Fabric buckets are FUN ... seriously! Christina blogs at A Few Scraps ... go check it out. She just made a messenger bag using Jennifer Sampou's new Shimmer fabric collection ... drool. Before you look at the fabric buckets ... warning warning warning ... they are addictive! Fun and so easy to make ... and I can take no credit whatsoever; I simply followed Christina's excellent instructions. The fabric bucket on top and to the right were quilted with free motion designs but the fabric at bottom left was quilted with a decorative stitch and a walking foot ... easy as can be! I want to make gobs and gobs ... to organize socks, scarves, gloves and in my sewing room, the fabric buckets are ideal for zippers and trims. One of my students thought up this idea: line with a laminate for a pot of flowers. And of course they are a perfect gift container for a quilter ... just fill with a pattern and some fat quarters! Happy Easter weekend everyone and thank you for stopping by. PS ... I am now hooked on fabric buckets ... you too? You might enjoy my Pinterest board of fabric buckets, bowls and baskets. 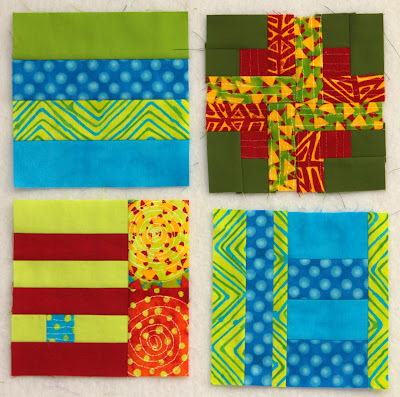 I can hardly wait to see next week's installment of modern blocks as well as launch a third class who will begin planning their quilts. Meanwhile, I have an update on our work in progress. Linda D surprised everyone last month! Not only did she bring 20+ beautiful new blocks, she started over with a completely different group of fabrics ... zombies! Next up is Sherry W ... her modern blocks feature her collection of Australian prints. What a gorgeous palette ... and those tiny dots add such sparkle to her quilt! 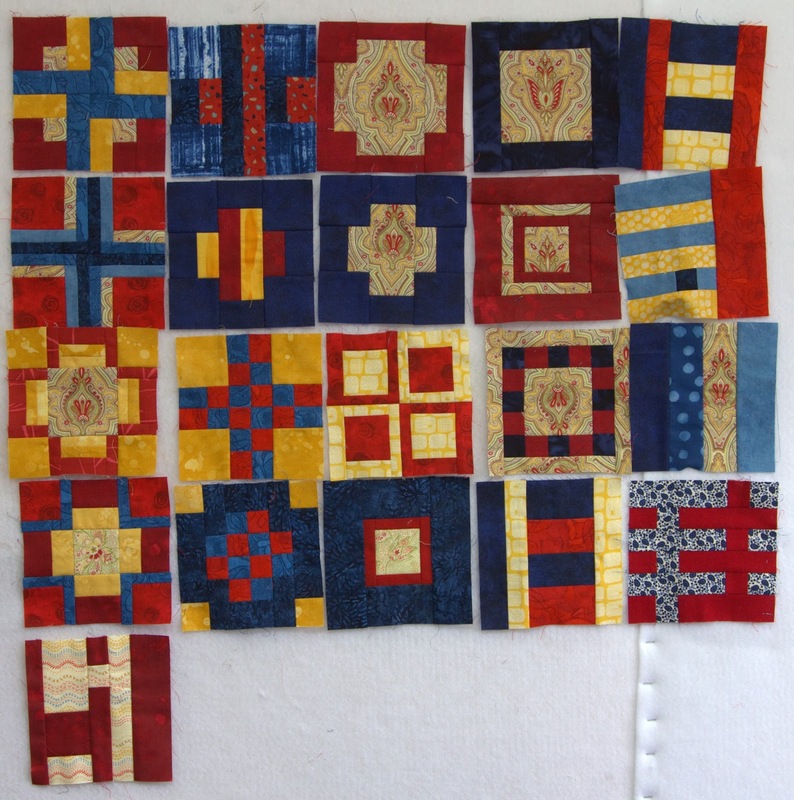 Instead of one large quilt, some are making two smaller quilts with their blocks. Next up are several collections of bright and happy quilts in the making. 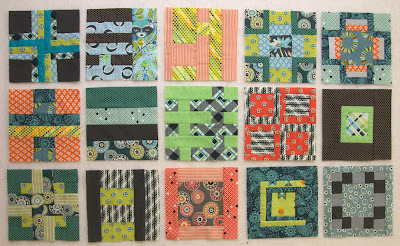 Karlee designed an original "pair of diamonds" block for her quilt (bottom right) ... yea! Charlotte and Heather are working with grays for their modern quilts. Lana and Lynn are working with a softer palette. Lana is planning to lay out her quilt so the predominantly yellow blocks form a diagonal across the center of her quilt then blend to pale gray and aqua in the upper left corner and darker teal and charcoal in the bottom right corner ... great idea! I hope you enjoy their thoughtful, beautiful work! Happy New Year! To kick off Quilts & Paws in 2014, I send all of you my best wishes for a happy, healthy, fulfilling year. Here in the Willamette Valley, early December 2013 brought heavy snow followed by a week of frigid temps. To give an idea just how much snow, here's one of the feeders we diligently kept full for our birds and squirrels. Our house in the trees looks its best while the snow is still pristine with most of the weeds and yard chores hidden from view. Just how cold was it? A week of bitterly cold temps from the teens all the way down to zero left the creek in our back yard frozen over ... the only time that has occurred in the 16+ years we've lived here. But trust me, I didn't test it to see how thick the ice was! No one enjoys snow more than our two goldens ... they both absolutely love it! Frankie likes to eat snow, catch snowballs, romp and roll. Even though he's 11 years old, I think he still has a sweet baby face. 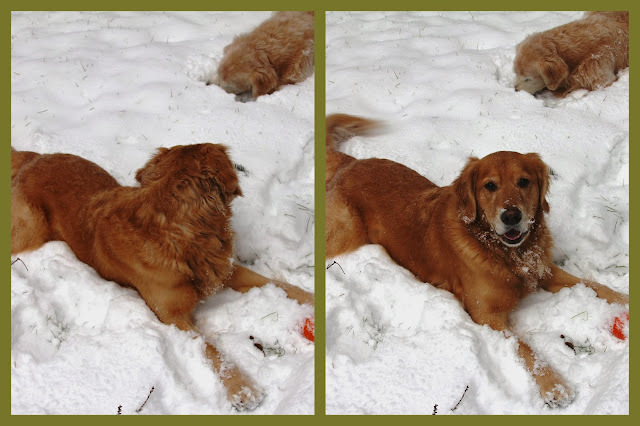 For Nickel, who will be 3 years old this spring, this was his very first snow. It was fluffy, powdery snow that wouldn't pack into a snowball so we had to make do with the Kong toys. The canine world seemingly has no concept of "one for you, one for me" ... there is only ever one desirable toy at least so far as Nickel is concerned. Frankie, gentle soul that he is, rarely contests the possession of a toy. Nickel, however, is ever vigilant ... constantly keeping on eye on Frankie's interests. His toy is better than my toy? 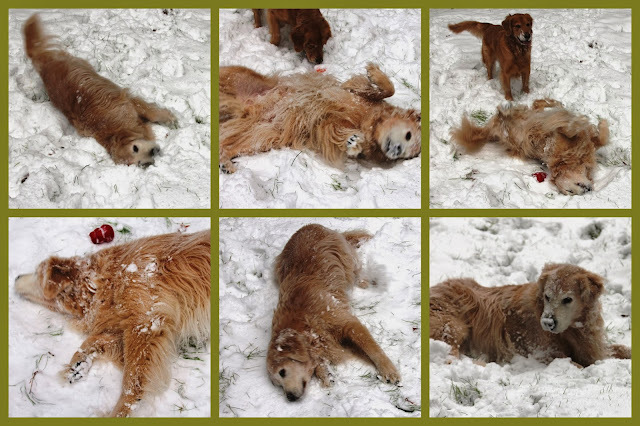 I mentioned that Frankie loves to roll in the snow; he demonstrated the proper way to make a snow angel for the inexperienced Nickel. Just as we started to head in the house because I was freezing, our neighbor John who lives to the south of us, started doing something very interesting in his yard. Notice that Nickel has commandeered both toys. ... followed a moment later by several sharp "bangs" as one of our neighbors to the north decided the snow inspired a little back yard target practice ...an alert to the north in perfect unison. I am thoroughly enjoying the making of Tula Pink's City Sampler blocks. 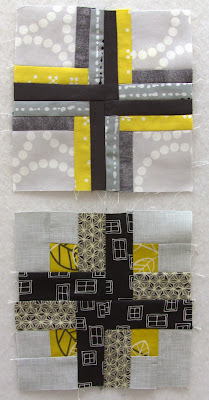 It is delightful fun to pick fabrics, cut and sew the modern 6" blocks! Starting in October, two groups at the Pine Needle embarked on this journey together and a third class will start in February. In the first class, we discussed quilt sizes and layouts, then planned preliminary color placement before we jumped in and started sewing. I am so excited about these quilts and can hardly stand the wait from month to month to see what everyone has made. 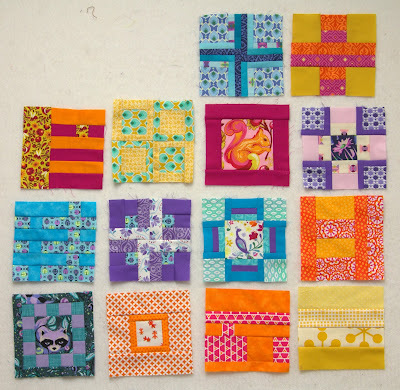 Here are some of the fabulous blocks my students have made, starting with a happy, colorful palette of fabrics by Jan C ... and please let me know if I don't have the correct person associated with her work! Next up are the blocks of Karlee S ... I love the way she is combining Tula Pink's Acacia and Denyse Schmidt's Florence fabrics! Charlotte W chose a subtle, monochromatic palette of grays, creams and golds ... with a surprising hint of aqua that sets off her blocks beautifully. 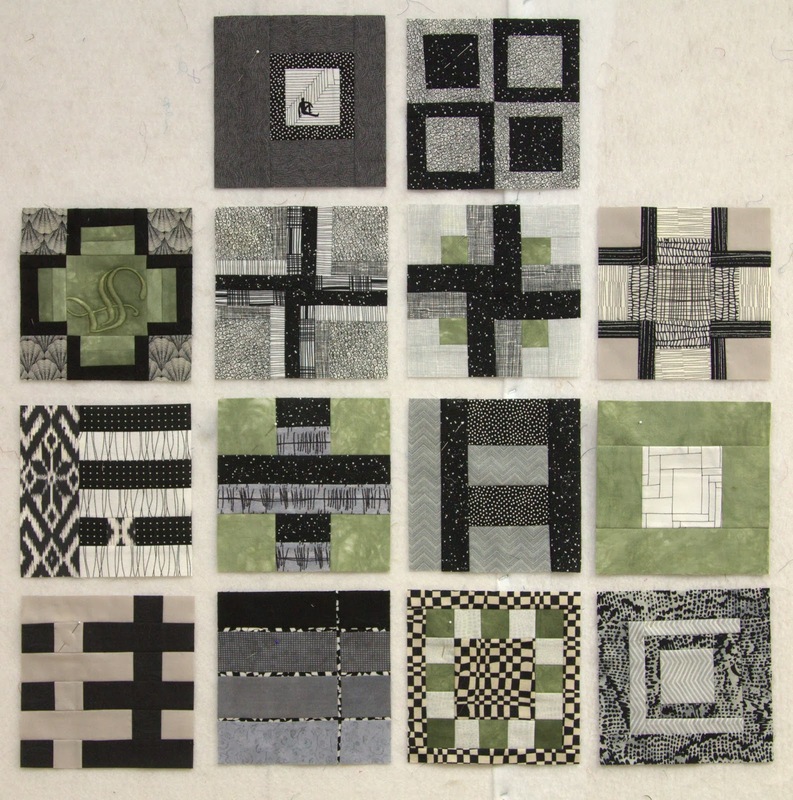 Here is a detail photo of Charlotte's blocks ... I love the purse in the center as well as the clever way she used a stripe to frame the center flower in the block on the left. Donna B is also working in a subtle, monochromatic palette ... with a touch of green in the form of hand dyed damask. The black and white graphic prints give her blocks such drama! Lynn B chose a tranquil blue, teal and green palette, a color scheme she fell instantly in love with the moment she saw the fabrics at the Pine Needle. 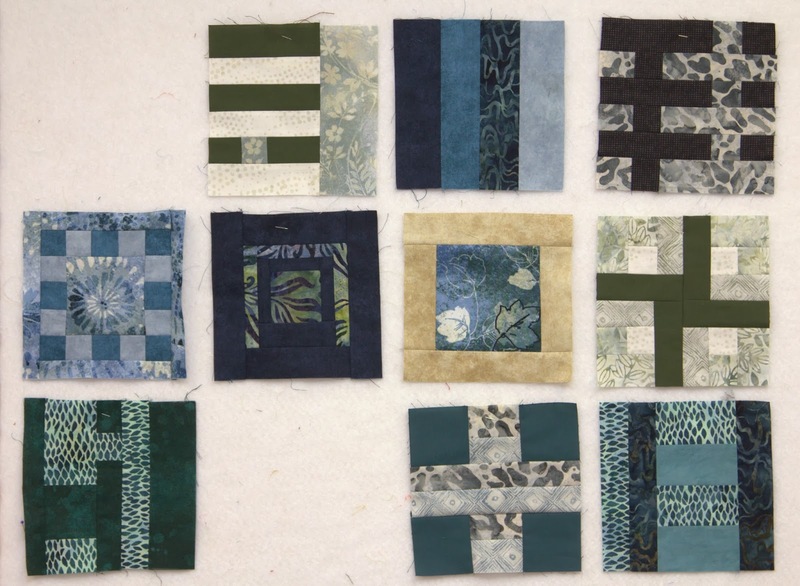 As we work, we are all continuing to find new fabrics to add to our collections for our City Sampler quilts. Thankfully, we have a playground of 100 blocks! 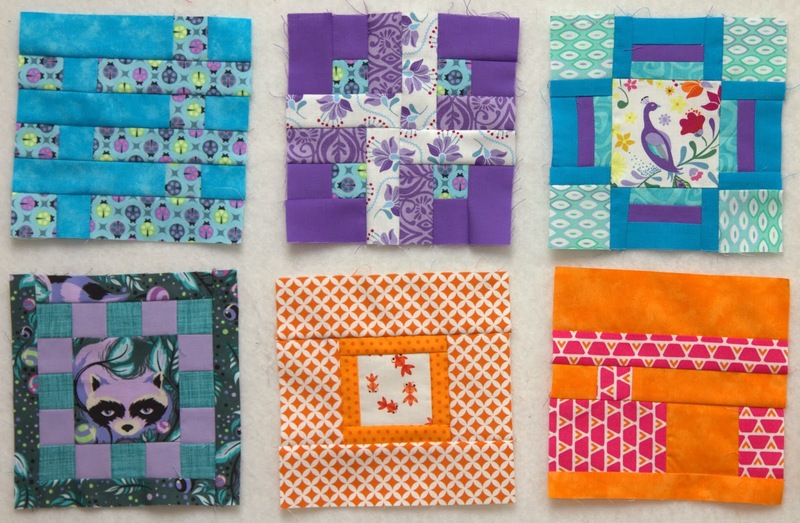 Pansies are Pam G's favorite flower ... so is the perfect feature fabric for her quilt. 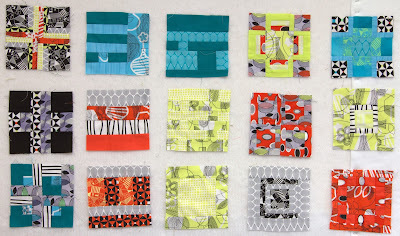 Pam is also asking others to select the fabrics for a block and is naming the block for that person ... great idea! 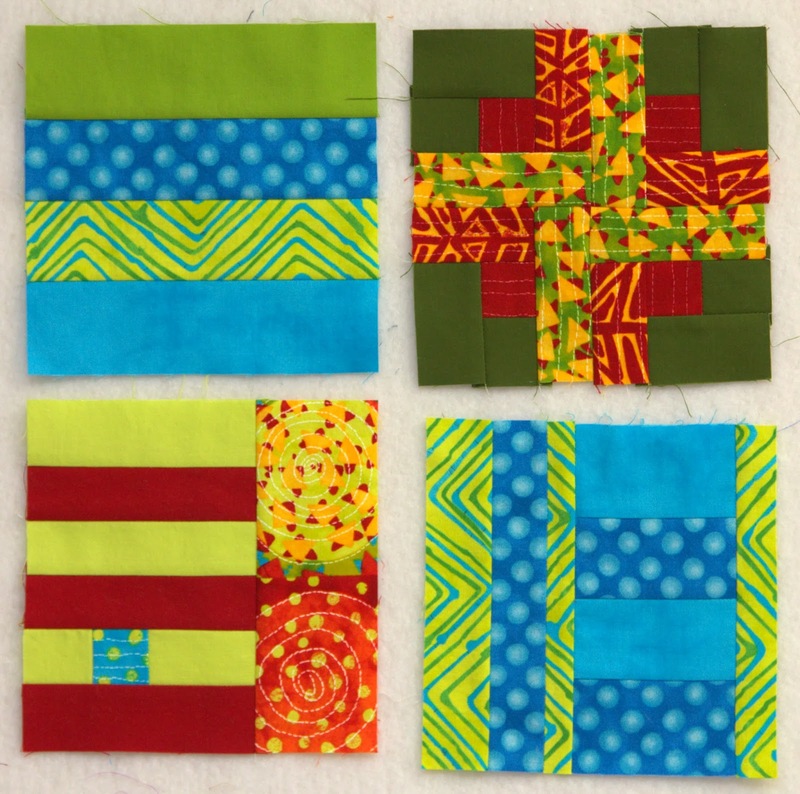 Pam is also using some vibrant, colorful silks in her blocks. 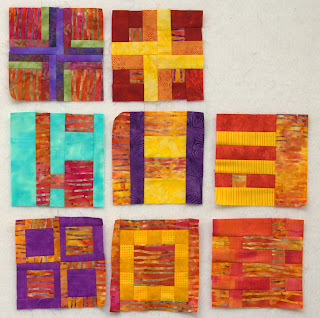 Kathy A plans to make two lap-sized quilts with her blocks. 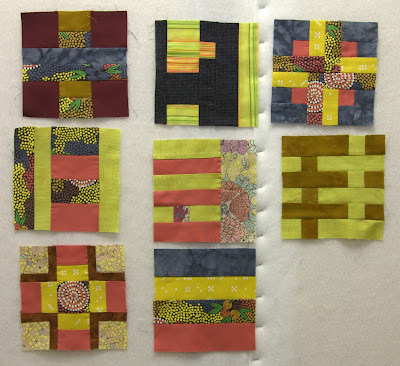 One will be inspired by the colors of the desert Southwest but shown here are the blocks she will use in her quilt inspired by a flower garden. The interesting twist Kathy plans is a thunderstorm looming over the garden ... I can't wait to see! 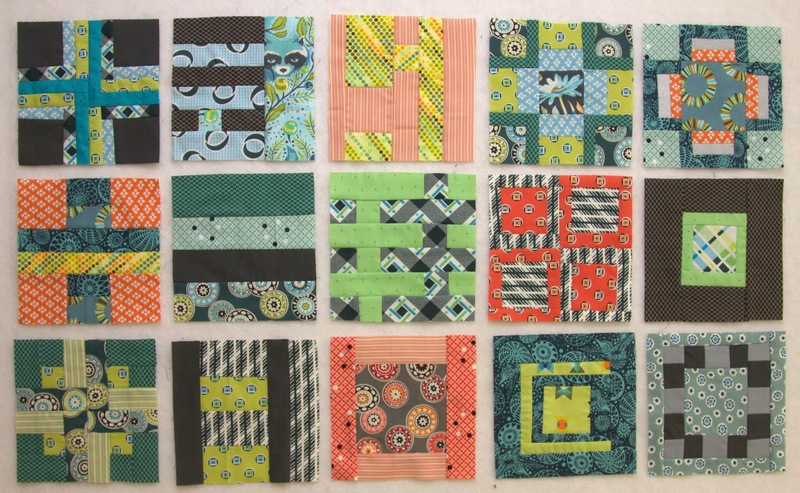 Here is another delightfully happy palette of fabrics selected by Linda D who plans to set her blocks on point. Isn't it smart to put the blocks on the design wall on point as well? The black and white prints in her blocks are magic! Here is another subtle, calm palette of soft aqua, gray and yellow ... and a touch of green. 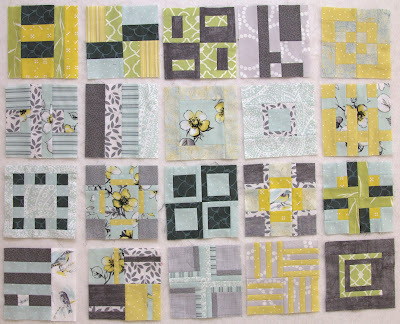 Lana K's blocks feature a beautiful floral print and bird print from Dear Stella's Paloma collection. Aren't her blocks lovely? 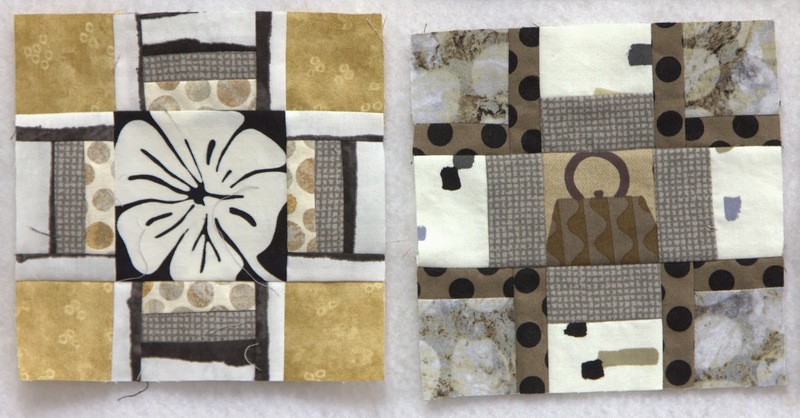 Heather J loves large scale graphic prints and has chosen a palette of grays, whites and yellows. I am eager to see more and will do my best to take more photos from our next classes. 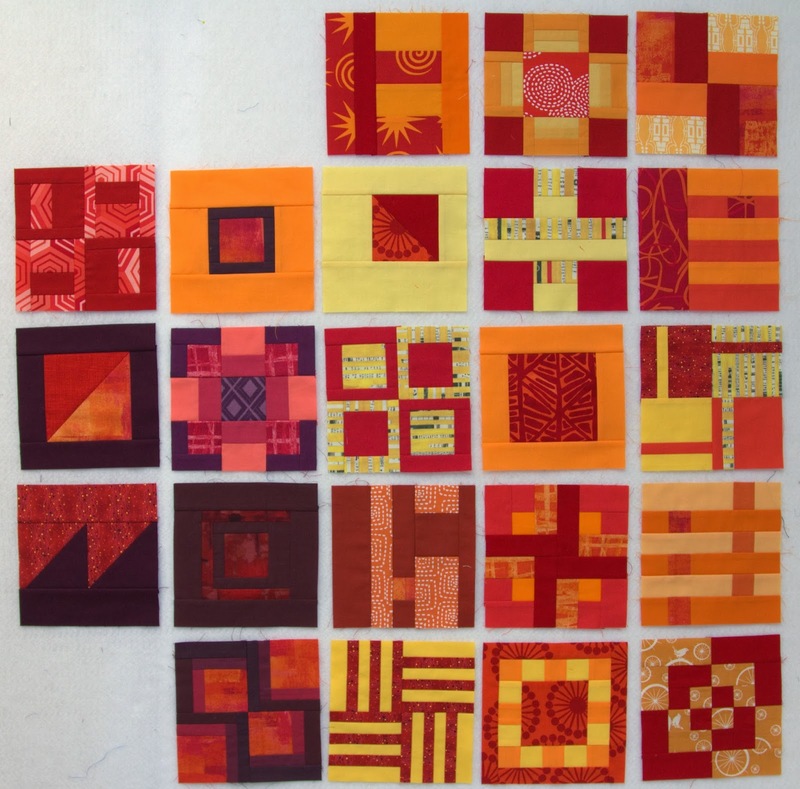 Here is another bright, happy palette of blocks by Carolyn B who wants to "get modern" with her quilting ... I think she's got it! 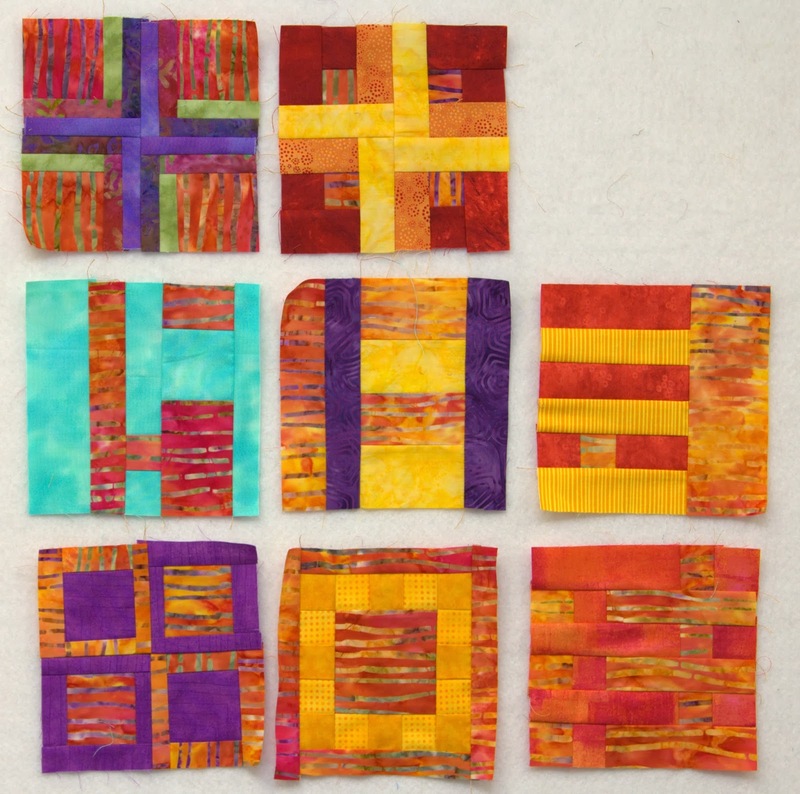 Carolyn is doing a great job with her vibrant, rich colors and dynamic prints. Peggy FY is working in her favorite colors ... rainbow brights! After quite a bit of experimentation, Peggy decided to add black and white prints which I think are making her blocks sing! 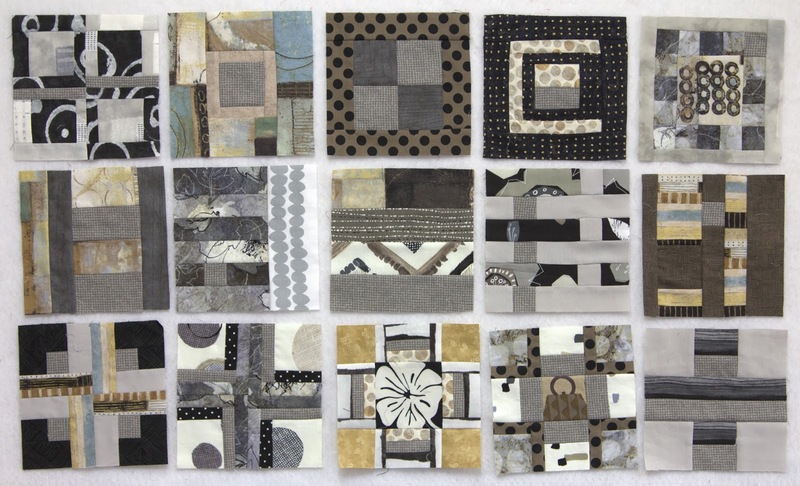 Kathy S fell in love with the Astrid collection by Erin McMorris ... along with solids, black and white prints and one of my favorite Art Gallery prints, Squared Elements. These are happy, bright and energetic. Lou Ann T loves to work in red, yellow and blue, her favorite color palette. I think working with the three primary colors can be quite challenging but Lou Ann has clearly mastered it. Sherry coordinated a variety of prints and solid fabrics with a beautiful Australian print. I love the spiral of white dots in the Australian print and that lime green and orange stripe is perfect! 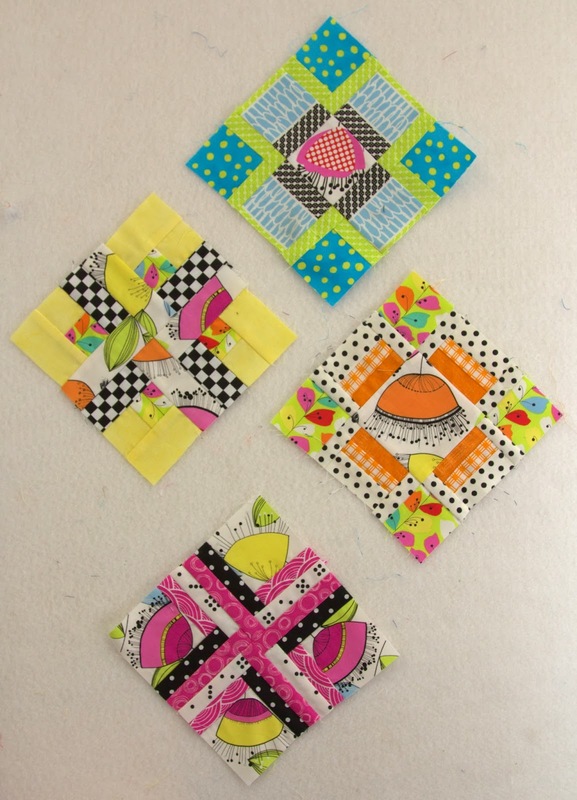 Sherry plans to make two lap-sized quilts. It turns out that the group of coordinating fabrics works great with two different Australian prints. Finally, here are my blocks. I decided to work in a limited palette of reds, oranges and yellows and am pushing that palette as far as I can. I am working mostly in solids with a few "low volume" prints for drama. Have you heard fabrics described as low volume? These are prints that use a small number of colors ... red and white, red and orange, yellow and white for example. I hope you are enjoying these blocks!